NOTE: We are aware of the approaching weather and the tournament will run as scheduled. We will continue to monitor the weather reports and will post any & all updates here if needed. Please take extra precaution and allow for extra time as you make your trip to Ft. Wayne. Parents and spectators will need to purchase wristbands (1 and 2 day packages are available at the ticket counter at the Coliseum Saturday or Sunday). If your team plays at Empowered on Saturday, your families can purchase wristbands at the front desk at the Empowered facilities. The wristbands will be honored at both playing venues. 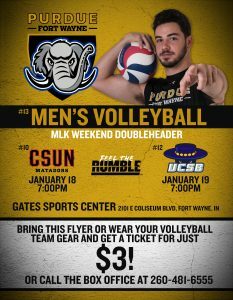 $3 Tickets to Men’s Volleyball Games Friday & Saturday Night! Present this Flyer for your $3 ticket!